The Red-billed Chough (Pyrrhocorax pyrrhocorax) is a member of the crow family distinguished by its striking red feet and elegantly curved bill. The chough is slightly larger than a jackdaw, and is smaller and more graceful than a carrion crow. Although described as a black bird, the chough’s plumage has a blue/green sheen. Males and females are identical, although generally the male is slightly larger than the female. Choughs are between 37-42 cm in length with a wingspan of 65-80cm. Weights range from 280-350grams – males being usually heavier. The chough is protected under Schedule 1 of the Wildlife and Countryside Act 1981, and is classified as Least Concern on the IUCN Red List. This classificiation is for the species as a whole, and the level of threat can vary greatly in differing local populations. 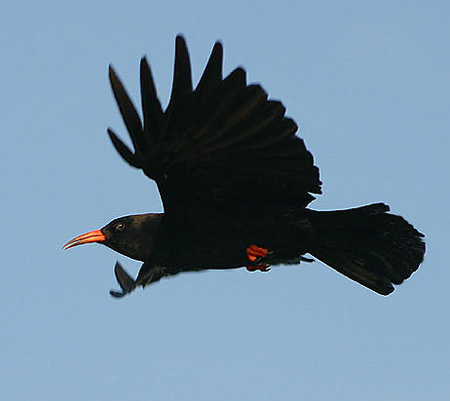 The Red-billed Chough is a non-migratory resident through most of its range – Westerly from Ireland, Wales and Scotland, and more recently Cornwall. It also breeds in the Isle of Man, Brittany, and has a varied distribution through Europe, The Canary Islands, North Africa, and Asia as far as China. The chough is very much a bird of the coast, although some are found in quarries and mountains, for example in Wales. It probes for invertebrates and larvae, using its specialised curved bill to hunt for its prey. Their preferred habitats are natural coastal cliffs which are rich in insect life, especially ant communities, where rocks and exposed soil meet wind-scoured maritime grassland. Short-grazed old pasture is very important as a back-up resource, especially in the winter and where the quality of the cliffscape is not optimal. In Scotland winter feeding in cereal fields can be important. It is a superb and acrobatic flyer, and can be distinguished when soaring by the “finger feathers” at the wing tips. Its name is possibly derived from its call – a loud “Chee-ow”, and this is often the best way to find choughs when out on the cliffs. It is a highly sociable bird in winter, gathering in large flocks. 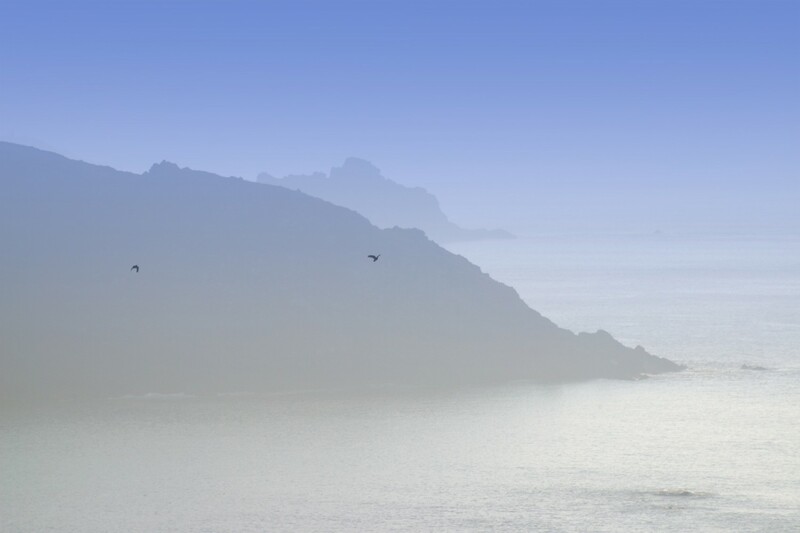 In summer pairs of choughs will disperse to their long-term nest sites. They build a nest of twigs lined with moss, lichen and sheep’s wool. Courtship often includes “mirrored” flying displays where the male and female will follow each other’s flight patterns. The female will lay between two to six eggs, with five eggs being a general average. The eggs hatch after 19 days, and both parents feed the young until they fledge at six weeks. The young birds will follow and harass their parents for food for most of their first summer, until becoming independent and spreading their territories during the winter months. Choughs do not normally breed until two or three years of age and can continue breeding until almost twenty years old.